Roland XS-84H 8-in x 4-out Multi-Format Matrix Switcher with iPad. Los Angeles, CA, June 4, 2015 — Roland announces a powerful new version 2.0 update for its XS Series Multi-Format Matrix Switchers. The XS Series rack mount switchers offer features benefitting both live production and fixed installations, enabling processing and switching of digital or analog video sources to multiple outputs simultaneously. New 2.0 features include uninterrupted output mode switching, cross dissolve switching, PGM/PST operation mode, enhanced customization Picture-in-Picture capabilities and a new customizable iPad app for wireless touch control. The XS Series Matrix Switchers come in three configurations: XS-84H is 8-in x 4-out, XS-83H is 8-in x 3-out, and the XS-82H is 8-in x 2-out. Each provides high-quality, integrated video and audio conversion and switching with iPad control. The XS Series supports HDMI, HD Component, RGB, and composite video signals with output resolutions up to 1080p. Up to eight compatible line or two mic inputs with digital audio effects can be accommodated. 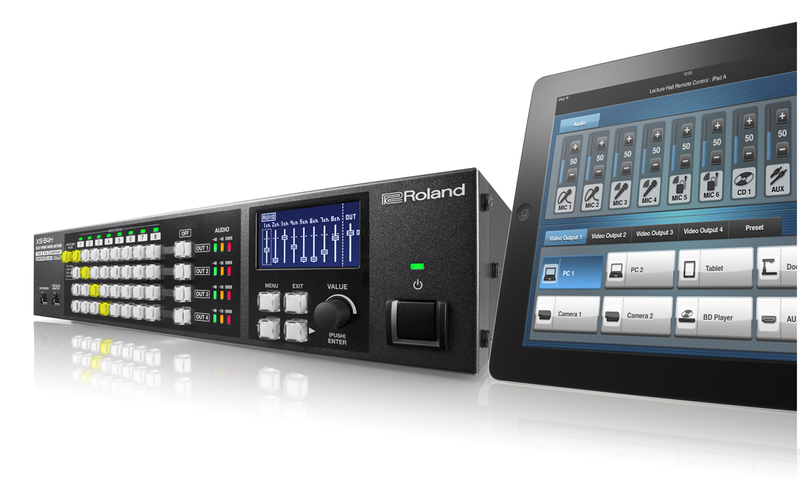 Users can remotely control the Roland XS Series using the native iPad app, XS Remote, via RS-232C interface, or control over LAN connections. Remote control is valuable for installed applications where front panel controls are not accessible or a programmable touch control interface is required that can access functions of the XS Series. Advanced video processing functions makes multiscreen video productions possible for both signage and live applications such as HOW environments. Users can scale a single image across multiple displays using the SPAN mode, then quickly and easily switch to a different image on each screen in MATRIX mode. Each input channel supports adjustments for scaling, positioning and aspect ratio before output, ensuring the best possible picture. The XS series can switch between and route HDCP video from computers, smart phones, blu-ray, and even still images from internal memory to displays ideal for education and live production applications. Up to four HDBaseT outputs can be used for long distance transmission of audio and video content to displays throughout a campus. Roland’s new HT-TX01 HDBaseT Transmitter and HT-RX01 HDBaseT Receiver products convert HDBaseT signals to and from an HDMI signal ideal for use with the Roland XS Series. They transmit or receive audio, video and RS-232 control information up to 100 meters over Cat5/6e cable. The HDBaseT products are HDCP compliant and support signals up to 1080p as well as WUXGA over HDMI to connect video cameras, computers, Blu-ray decks, switchers and other sources to LCD monitors, projectors, video switchers, and other display devices up to 330 feet away. For teleconferencing applications, the XS series features four internal audio/video busses. This can be used to create minus-one audio to feed directly into teleconferencing systems. Switch up to eight computer and video devices in both analog and digital formats. In addition, an audio ducking function lowers audio levels when microphone audio is detected, making it ideal for conference or boardroom environments. The XS Series Version 2.0 features will be demonstrated at Roland’s InfoComm booth #853. Photo caption: Roland XS-84H 8-in x 4-out Multi-Format Matrix Switcher with iPad.